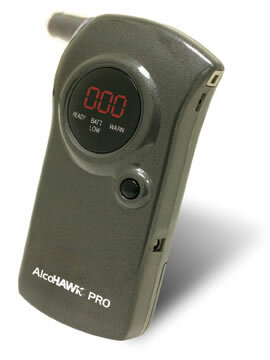 The AlcoHAWK® PRO has obtained FDA 510K Pre-market Clearance and meets DOT Standards as a Breath Alcohol Screener. It utilizes a state-of-the-art semiconductor oxide sensor to test breath alcohol content quickly and accurately. The simple one-button operation provides a digital reading in seconds. The PRO includes AirCheck Techology to ensure a sufficient breath sample is obtained. The PRO also now include Sensor Recognition Technology to monitor for certain types of abnormal sensor conditions. The AlcoHAWK® PRO includes five mouthpieces, hard carrying case, soft zipper cover, 9 volt battery, car power adapter, wrist strap, owner's manual, quick start guide, and a 1 year warranty. 1 - Estimate, results may vary. 2 - Read Owners Manual before use and follow instructions carefully. All digital breath alcohol detectors offered from Q3 Innovations, LLC (Q3) come pre-calibrated, but it is recommended that you have a breath alcohol detector verified for accuracy every 1-12 months, depending on frequency of use. If you are using the breath alcohol detector multiple times daily, it is suggested to have the device calibrated at least monthly. If you do not use the breath alcohol detector daily but still use it several times a month, then it is suggested to have it verified at least every 6 months. If you use the alcohol detection only on rare occasions, then you should have it calibrated at least yearly. Calibration helps ensure that your device is operating correctly, and is an inexpensive way to greatly increase the useful life of your breath alcohol detector. What Is the Cost of the Calibration Service? The cost of a calibration service is $19.99 per calibration. This price includes Q3s return cost of shipping within the continental United States. Q. Can I recalibrate a breath alcohol detector myself? R. No. Recalibration requires the use of advanced breath alcohol simulators to correctly perform recalibration. Q. Which breath alcohol detectors can Q3 calibrate? R. Q3 can calibrate all AlcoHAWK®Series and the FC Series breath alcohol testers. Q. If I did not purchase a breath alcohol detector directly from Q3, can I have Q3 recalibrate my device? R. Yes. Simply follow the procedures described above. Q. Is recalibration included in the warranty? R. No. The warranty is limited to any defects with the unit, and does not include routine maintenance such as recalibration.